Are you a couple or a small group of friends who want to have a holiday onboard a yacht, but can't get enough people together to book the whole boat? This is not a problem as you can choose our 'Share a Yacht' option (also called cabin cruises), where you will share the boat with other likeminded people. The majority of bookings we have on our Greek Island cruises every summer are actually by couples or friends who book just a cabin, just like you would do on a cruise liner. 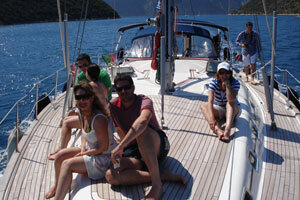 The maximum number of guests on board is 8 and you can have as many people in your group as you want. You can socialize as much as you like with the others but there is plenty of space for the moments that you want to be alone. We sail for 4-5 hours a day and the rest of the time is spent in a bay during the morning or moored at a village for the evening, so you can always leave the boat and do your own thing. 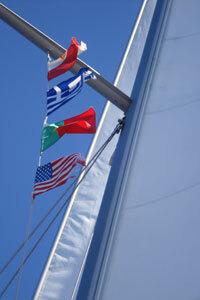 On our Share a Yacht cruises we always suggest an itinerary that we know will be liked by everyone. The most important is that you are going to be on a yacht with likeminded people who want to go off the beaten track, have a little taste of adventure and meet the locals.